Liz joined Praxis International in 2003. Based in Duluth, Minnesota, she first worked on the Rural Technical Assistance Program. In 9 years, she planned and facilitated more than 500 audio conferences for technical assistance providers who train rural agencies across the nation to respond effectively to violence against women. In the past several years she has worked across all Praxis programs, designing and implementing hundreds of webinars. In 2011, her focus shifted to coordinating national audio conferences and webinars for advocates participating in the Advocacy Learning Center. Liz also maintains and updates our website for all Praxis programs. Economic justice and safety for women and children have been the crux of her efforts throughout her life. Praxis’s work to end violence against women and children continues to inspire her. Outside of her professional endeavors, Liz is a mother, sister, and aunt who loves to travel, camp, and hike. 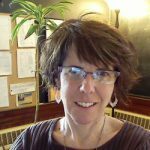 Liz’s social justice work began in 1992 with a 3-year commitment as a live-in volunteer at a homeless shelter in Duluth. That experience sparked her ongoing passion for social change and underpinned all her further professional efforts. Before joining Praxis, she worked on issues of homelessness, chronic mental illness and substance abuse, affordable housing/low-income homeownership, and small business development for income-eligible entrepreneurs.